We have friends with kids who live in Elmhurst, and in the kid-shuttling, dropping-off, babysitting trading, we often arrive with dinner in-hand to allay the chaos of the evening. Boston Market has been our standby, largely because they're everywhere and offer something resembling actual meat and vegetables. This particular evening, we were headed to a movie - and decided to ditch both dinner and the kid in favor of a pre-theater meal. We've both noticed the location on North Ave a couple times, thinking that it looked promising...so, today, at the suggestion of the 'spouse we stopped by. The chicken was excellent, nicely charred with a good smoky flavor throughout; we opted for Mexican sides (in this case, grilled green onions and a whole grilled jalapeno, salsas and tortillas) but there was also an entire complement of American-style sides like roasted dilled potatoes, green beans, etc. a la Boston Market. 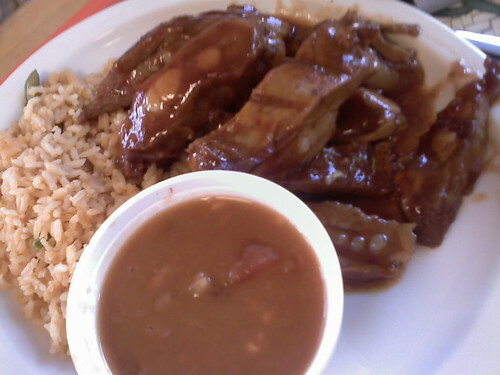 Rib tips came from the steam table, were swimming in a not unpleasant sauce and still had quite a bit of tooth; came with rice and a choice of beans. 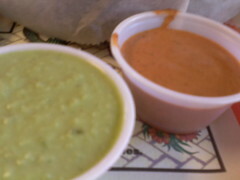 Salsas were creamy-style and waay to hot for me, even a bit on the hot side for the 'spouse, who isn't as capsaicin-averse as I. 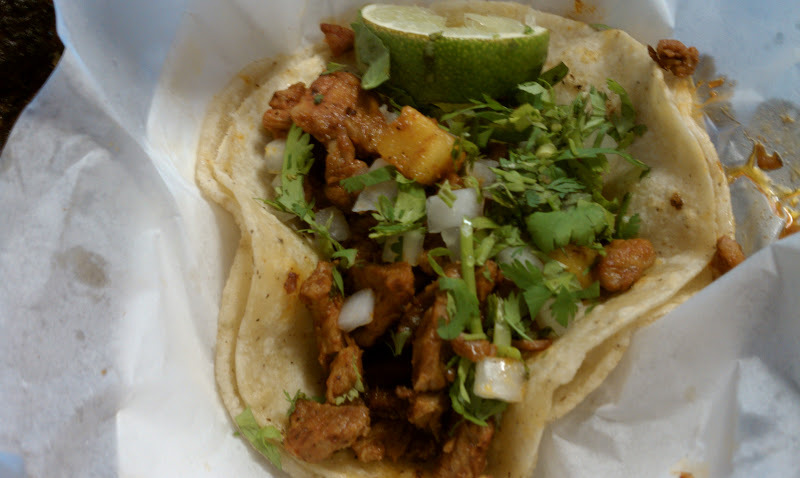 The tacos were very good; a fine rendition of Al Pastor with a few bits of pineapple and a genuinely terrific taco de tripas: greaselessly crisp. It's a bit of an odd location, but they seem to be balancing the needs of both serve gringos and latinos quite well. There's a fridge case of cheesecakes, Mexican soda, and fill-it-yourself Pepsi products fountain along with dispensers of Tamarindo and Jamaica. The only miss of the meal was the horchata, which the 'spouse pronounced to be too bland. 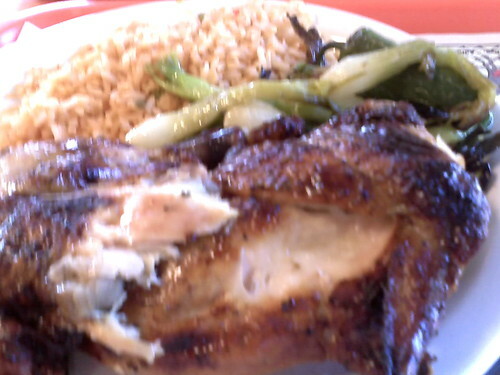 I went to the Rosticeria a few years ago and I remember the chicken being decent, but a little on the small side. I believe they use a Souther Pride smoker. As far as the Cascade Drive In feud with Scooby's, allegedly Cascade asked Scooby's to turn off their neon during showtimes as they believe it interferred with the quality of the picture. Scooby's declined. So if you are caught trying to bring Scooby's food into the drive in, well...it's severely frowned upon. Scooby's has pretty good fresh cut fries, but they serve kind of a sad skinless dog, I think Chicago Red Hot brand. As far as the drive in, the concession stand is pretty cool in a time warp sort of way. If you look around, I believe they still have baby bottle warmers. I've been here 3 or 4 times for lunch now. It is a solid spot with some tasty chicken. My usual order is the 1/2 chicken mexican style and a pastor taco. 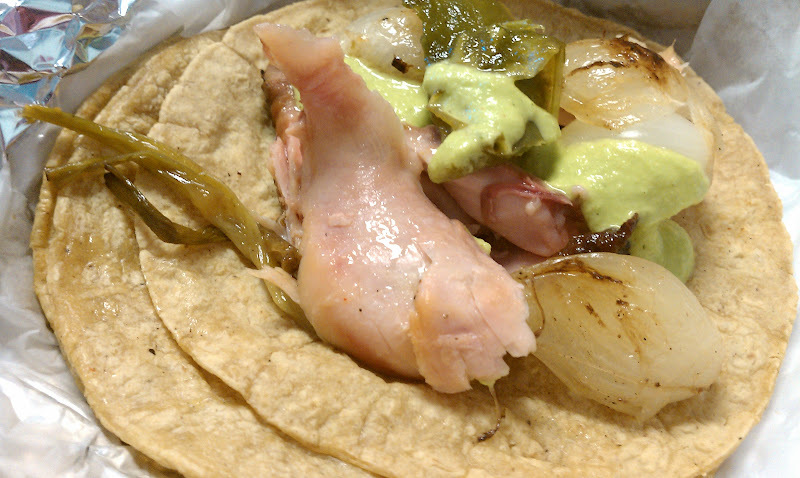 Chicken comes with tortillas, rice, beans, grilled jalepeno and grilled knob onions. Chicken is moist and a little smokey. A little bit of a smoke ring on it. Pastor is decent enough, certainly not off a spit, but not the mushy sauced up garbage that you find in a lot of places. I wouldn't call it destination dining, but if you are in the area it's a good place to put in your lunch rotation. Glad you liked it! We still go every now and again - I've found that if it isn't busy when you're there, the food tends to suffer from being held - lunch is probably the ideal time. 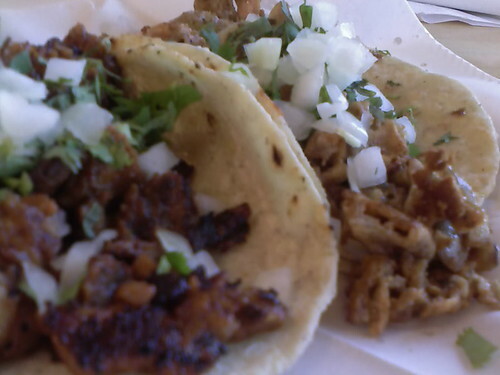 Still my favorite tripas, though the last time we had them they weren't quite as crisp as the first. 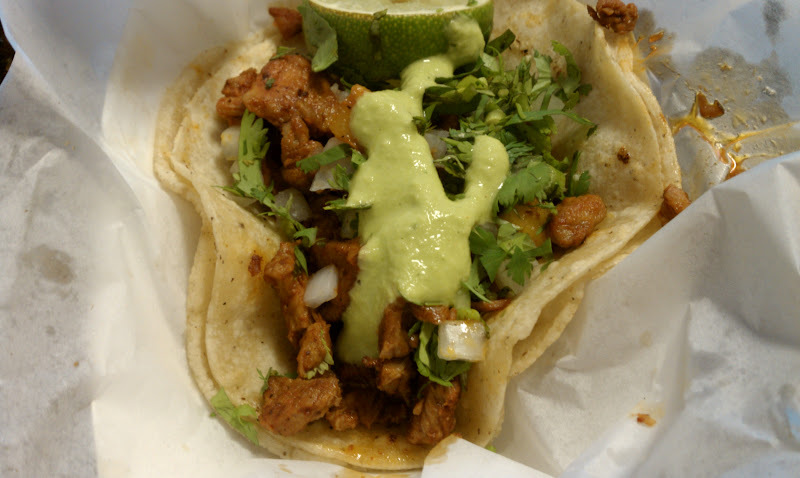 When I am out near Elmhurst, this is my place for tacos. Tonight my daughter and I shared a steak torta and tacos, we were both very happy. I really like their spicy red salsa. I don't like the chips that come with them as well. I prefer the store bought El Rancheros any day. I stop by the Rosticeria when I am in the neighborhood. I have only had the barbecue, strangely, as I bet the Mexican food is better. 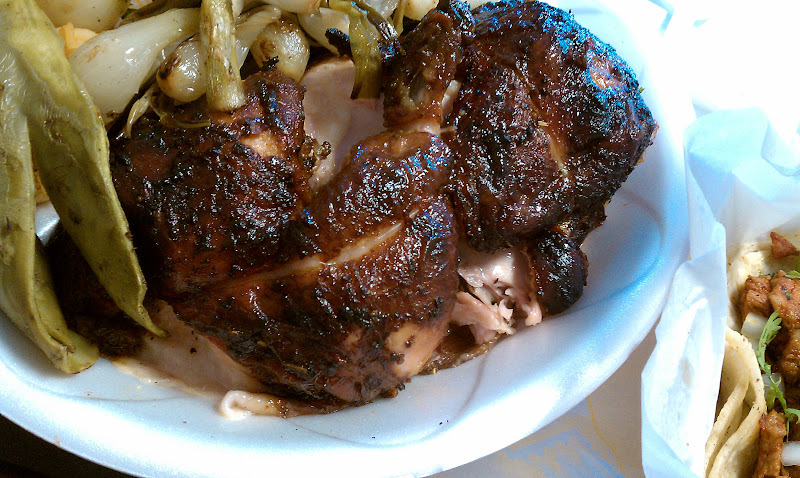 But I like the smoked chicken pretty much, with some beans, tortillas, hot sauce and horchata, and the ribs, while not that great, have a certain candy-like attraction for me. Good prices, reliable quality, usually soccer on the TV, nice people.